1. Be a good role model. Your teen does notice. 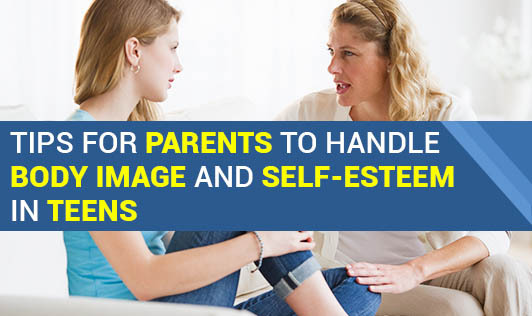 Your teen is closely observing your lifestyle, eating habits, and attitudes about issues like appearance and weight, even if she seems to cringe every time you speak. Pay attention to the example you are setting, and make changes if you don't like what you see. Looking at yourself through your children's eyes can be a great motivator to begin an exercise program, adopt a healthier diet, or turn off the television and get moving instead. Remember, your child will also model your attitudes about your body. So if you're constantly decrying your hip size or thinning hair, your child will learn to focus on her flaws instead of her attributes. Never make critical remarks about your teen's body. If she has a weight problem, you can be sure she's aware of it. Your negative remarks will only make her feel more discouraged and could make the problem worse. Instead, compliment your teen. Tell her what a pretty smile she has, or how that shirt makes his eyes shine. When you appreciate their physical capabilities -- "Thanks for opening that jar for me" or "You folded that laundry so fast!" -- you are building a positive body image. Help your teen make the most of his or her attributes by encouraging good personal hygiene and posture, healthy sleep habits, and stress reduction. If you feel you need more help, talk to your teen's school counselor or consult her health care provider and work together to come up with a nutrition and exercise plan. 3. Teach your teen about media. Don't let your daughter be a fashion victim or your son become obsessed with being muscle-bound. Help him or her develop a healthy skepticism about images in magazines, on screen, and on the web. Make sure your teen understands the airbrushing, photo manipulation, stylists, personal trainers, cosmetic surgery, and other tricks that make up the beauty industry and celebrity culture. Guide your teen to decode advertising messages that link products with personal fulfillment. 4. Emphasize other qualities over appearance. Support your teen to develop talents and skills that have nothing to do with appearance -- like music, sports, arts, and volunteer activities. Show an interest in his or her passions and pursuits. Acknowledge the good things you love about them, such as how they can make you laugh or their dedication to schoolwork or the way they look out for their younger siblings. Focus on health over appearance whenever possible. While it's important to have a positive body image, make sure it doesn't go too far. For example, in their quest for the perfect six-pack, some teenage boys exercise to an extreme, try to bulk up by using vitamins and supplements, or experiment with steroids. Watch for any dramatic changes in your teen's eating habits or weight, and consult his doctor if you have concerns. 5. Make good health a family affair. Your entire family will be healthier if you avoid fast food, keep junk food out of the house, cook nutritious meals, and get active. But you don't have to do it all at once to make a difference. Just one small change can start building your and your teen's confidence and help you work toward bigger goals. And having other family members sharing in these new behaviors will make your teen feel less isolated.